The Los Angeles Lakers measure success by titles, and titles by their place among dynasties. But on the way to titles and glory, there’s an entire 82-game regular season to play. The regular season is full of memorable moments, and you never know when history will be made. Here are ten of the most essential moments from Lakers regular season history. After the “Showtime” era, and before the Shaq and Kobe dynasty, a fun little enclave in Lakers history sprang up featuring players like Nick Van Exel, Eddie Jones, and Vlade Divac. The team played fast and loose, and this continued even after the team signed Shaquille O’Neal and traded Divac to the Charlotte Hornets for the draft right to a pick that would lead to Kobe Bryant. On January 5, 1997, the furthest expression of this team came into being when Van Exel laid 23 assists on the second-year expansion Vancouver Grizzlies (now the Memphis Grizzlies). While some of those dimes likely were the work of, ahem, generous scorekeeping, the box score was a signature moment for a fun yet fleeting time for the Lakers. In 1982, a January game against the Detroit Pistons wasn’t much to get excited for. Isiah Thomas was in the middle of a stellar rookie season, but the Pistons were well below .500 and led in scoring by John Long and Kelly Tripucka. It would be a few seasons before the Bad Boys era in Detroit officially kicked off. But the “Showtime” Lakers could put on a show regardless of their co-stars. 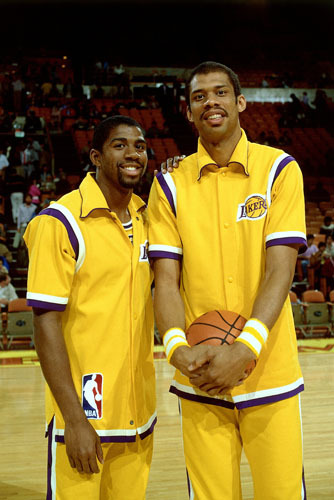 In this Jan. 22 game, Kareem Abdul-Jabbar had 19 points, 10 rebounds, and 10 blocks, and Magic Johnson added another 26 points, 16 rebounds, and 12 assists, making them one of just a handful of teammates in NBA history to record a triple double in the same game. Lakers fans aren’t used to playing spoiler, but when the chance arises, it may as well come against an all-time great team. In 2016, the Golden State Warriors had lost just five games in their first 60. The Lakers, meanwhile, had won just 12 games in 63 tries. 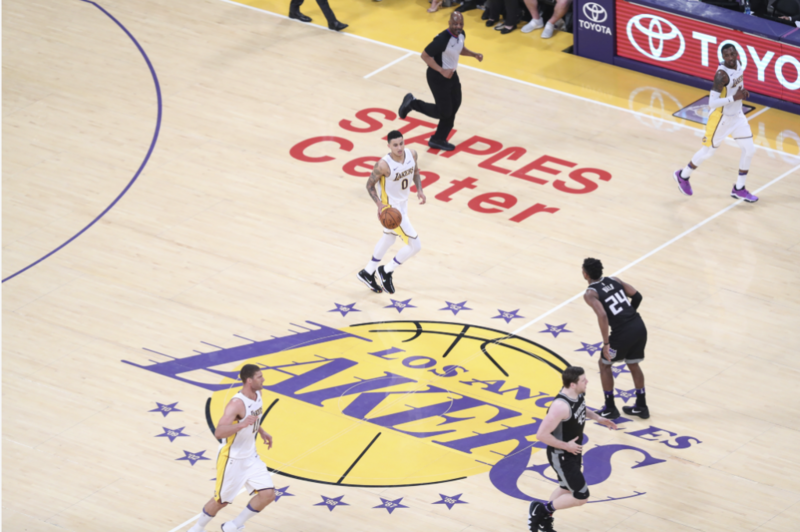 But the Baby Lakers weren’t bereft of talent, and homegrown young stars Jordan Clarkson, D’Angelo Russell, and Julius Randle had strong games to carry LA over Golden State 112-95. The Warriors would finish the season with a record-setting 73 wins, but the Lakers can look back and remember that before the Warriors blew a 3-1 lead in the Finals, they dropped a Sunday afternoon game in Los Angeles. The legend of Kareem Abdul-Jabbar playing — at a high level — until he was 42 years old only grows with time. It’s not necessarily common knowledge that in the 1985 NBA Finals, at 38 years old and after a wretched Game 1 performance, Abdul-Jabbar summoned the spirit of his youth and carried the Lakers to a championship. He was named Finals MVP, the oldest player ever to receive the award. But Kareem didn’t simply turn on the jets in the Finals — he averaged 22 points that season and put up a few gems along the way. The standout was a 40-point outing against the Houston Rockets on February 5, 1985, in which Abdul-Jabbar outplayed Houston’s two big men of the future: Ralph Sampson, the No. 1 overall pick in 1983, and Hakeem Olajuwon, the No. 1 overall pick in 1984. Sampson and Olajuwon scored 33 and 30 points, respectively, but the Lakers took the win 113-104. Signing Shaquille O’Neal in the summer of 1996 was just another peg in the Lakers’ long history of acquiring the top centers of their era. They had George Mikan, then Wilt Chamberlain, and then Kareem Abdul-Jabbar. Now they had Shaq, a 7-foot, 325-pound center who could drop a spin move in the open court as easily as he could rip down a backboard. It didn’t take long for O’Neal to show why he was worth all the fuss. In his second game as a Laker, in front of a home crowd in Los Angeles, Shaq dropped 35 points and added 19 rebounds against the Minnesota Timberwolves and future rival Kevin Garnett. The game is remembered today for a different reason: Kobe Bryant checked in for six minutes off the bench, his first minutes in the NBA. Just like that, a dynasty was born. Most buzzer beaters have some kind of stakes attached — a playoff win, or a March Madness tournament game. There are a few, though, that are so distinct you can recall the place and time when you saw them on SportsCenter. Kobe’s late-game performance against the Portland Trail Blazers on April 15, 2004, is one of those times. Ruben Patterson, the self-styled “Kobe stopper,” was helpless defending Bryant in crunch time. First, Kobe knocked down a twisting, winding, contorting 3-pointer to tie the game with 1.1 seconds left in regulation. Then, with the Lakers down by 2 in the second overtime, Bryant caught an inbound pass and hit another huge 3-pointer as the buzzer sounded. That buzzer-beater was the final shot of the regular season and catapulted the Lakers to a Pacific Division title and a No. 2 seed in the Western Conference playoffs. Elgin Baylor is one of the criminally under-appreciated stars not just in Lakers history, but across the NBA. Although he never won a title — he retired nine games into a 1971-72 season that would see LA bring home the championship — he gave as well as he got. In 1962, a season in which he averaged 38.3 points per game, Baylor out-dueled future teammate Wilt Chamberlain, who at the time was playing for the Philadelphia Warriors. Chamberlain had 78 points and 43 rebounds, at the time the second-highest total in NBA history, but Baylor kept pace across three overtimes with 63 points, 31 rebounds, and 7 assists. Later that season, Baylor would score 61 points to win Game 5 of the NBA Finals against the Boston Celtics — and Bill Russell — though the Celtics came back to win the series. The 2005-06 season was a special season for Kobe Bryant. He scored 35.4 points per game and seemed to be scoring 40+ at will. But two games stand above the rest. The first came when Bryant scored 62 points in three quarters against the Dallas Mavericks on December 20, 2005. The Bean had been hot all season, but that game seemed like a statement of intent. His 81 points against the Toronto Raptors a month later — on January 22, 2006 — was the follow-through. Bryant torched all comers, especially Jalen Rose, making 28 of 46 shots and snatching second place on the NBA’s all-time single-game scoring ledger. Wilt Chamberlain had a rough few seasons when he first arrived in Los Angeles. He clashed with then-captain Elgin Baylor, and flamed out in the playoffs for three straight seasons. First there was the infamous Game 7 against the Boston Celtics in 1969, in which Chamberlain did not return to the game for the final six minutes. Then there was the Willis Reed game in 1970, in which Reed and Clyde Frazier carried the New York Knicks past Chamberlain’s Lakers to win Game 7. And in 1971, Wilt and the Lakers didn’t make it past Kareem Abdul-Jabbar’s Milwaukee Bucks to advance to the Finals. That changed in 1971-72, when new head coach Bill Sharman reimagined the Lakers as a fast-paced team and Chamberlain as a defensive anchor and low-post player. The change was successful immediately. Beginning in the 10th game of the season, the Lakers won 33 consecutive straight games, keyed largely by the 35-year-old Chamberlain playing exceptional defense and rebounding prolifically. LA would go on to win the title in five games against the Knicks, but the 33-game win streak — still the longest winning streak in NBA history — made the 1971-72 regular season just as special as the postseason. Magic Johnson was one of the most anticipated rookies in NBA history, so his debut was always going to be an event. He didn’t disappoint, totaling 26 points, 8 rebounds, and 4 assists, but it was the way that he fit in that set the tone of the season. Johnson pushed the pace, found space with give-and-gos, and looked like he belonged on a playoff team. Then, down by 1 in the game’s dying seconds, Kareem Abdul-Jabbar took an inbound pass and floated a trademark sky hook through the net. Lakers win. Magic leapt into Abdul-Jabbar’s arms, and the veteran center told him to settle down — they had 81 more games to go. The Lakers would win their first title of the Magic era that season, with Johnson filling in at center in the deciding Game 6. A new era dawns yet again in Los Angeles this year – don’t miss a moment of the Lakers’ regular season by securing tickets today from Ticketmaster.